First visited February 2009. Last visited September 28th 2012. Migwang Spolex is my favourite local jjimjilbang, bathhouse sports complex. Migwang has five stories of amenities including squash courts, billiard rooms, and a very well equipped and friendly gymnasium. It is very clean and has well laundered towels which smell fresh. 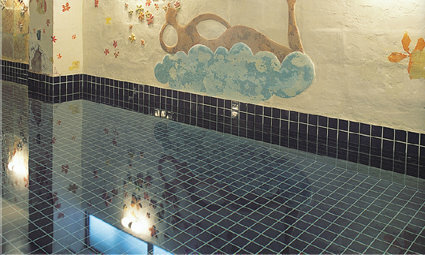 The bathhouse, a large one, is one to enjoy and relax in rather than to use solely for washing and cleaning. Sunday afternoons and holidays can be very busy. The gym is very well equipped and spacious and home to many Muscle Marys, especially in the evenings. 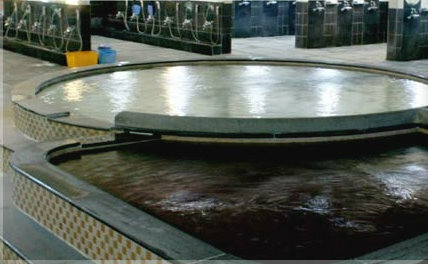 In summer, the ice rooms, of which there are two, one in the bathhouse and one in the jjimjilbang, are a refuge from the summer heat and humidity. I particularly like the changing areas as there are very roomy and with small poofes on which to sit while putting on socks’ etc – I hate having to do that sat on the floor or while trying to balance on one leg. Friendly staff. Unlike many other businesses in Korea, many which simply border on existing, I think Migwang is doing very well, financially. I’m told it has over 1000 members with a monthly membership. More to the point, I notice Migwang regularly installs or renovates features during major holidays. A new ceiling and what looks like a new water feature is currently being built (October 2010). However, the water feature seems to have stopped mid program. In April 2011 new poofes appeared. Migwang is always impeccably clean and the staff very friendly – oh, apart from some grumpy old guy! Times – 24 hour jjimjilbang and bathhouse. Gym open from around 6 am Mon-Sat until around 11 pm. Sundays 8 am – 8 pm. Double check opening and closing times as they occasionally change. 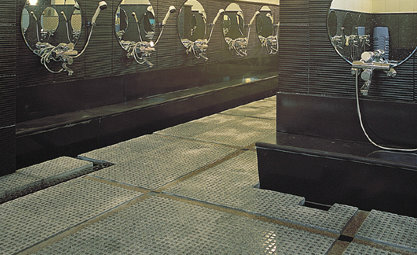 Facilities – 2nd floor, reception, women’s bathhouse, women’s hair dressers. 3rd floor jjimjilbang, 4th floor men’s bathhouse, 5th floor gymnasium. Also squash facilities, martial arts, aerobics classes etc. Jjimjilbang – ice room, various saunas, sleeping rooms, children’s play area, refreshments and food, small pc room, televisions, etc. Bathhouse (men) – around fifty stand up shower facilities and around the same number of sitting down shower units, event pool, (이벤트탕), hot pool (열탕), large warm pool with jacuzzi (온탕), large cold pool (냉탕), small tepid pool (안마탕), ice room, steam room, 2 jade saunas, relaxation area, heated sleeping area. Large changing room with television and sofas. 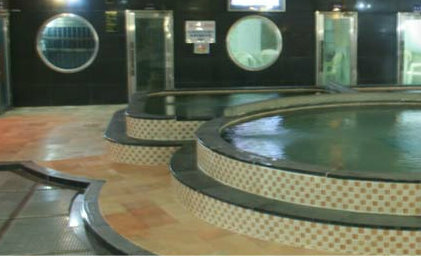 Televisions are also located in front of the e-bente-tang and hot pool, and in one sauna room but which can be viewed via from the other saunas. Cost – bathhouse 5500 Won, jjimjilbang 7000 won. 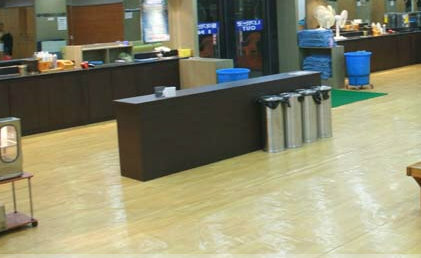 Monthly all-inclusive (including the gym) once a day usage, 100.000 Won (£50). Ambiance – relaxing, mid-level lighting, subdued television, very clean, very comfortable, friendly. Waygukin – I’m gradually seeing more and more westerners here. For a year I didn’t see any, but in the last year I have seen a total of 5. Some just shower, while others use the pools, some are friendly, some clearly do not want to speak. © 林東哲 2010. Creative Commons Licence. Thanks for the info. I’ll have to check it out! 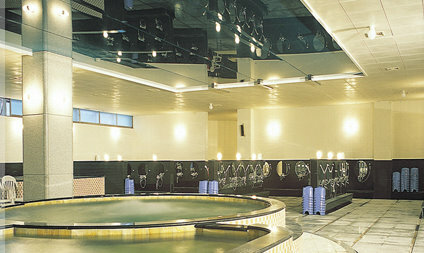 I was a member at the Migwang Spolex for 2 months – this included the gym, jimjibang and bathhouse for 100,000 won. It was very easy to sign up, even with limited korea/english and there is always someone in the gym to give advice with the machines etc. The gym can get busy in the evenings after 8pm but I have never had to wait to get started. 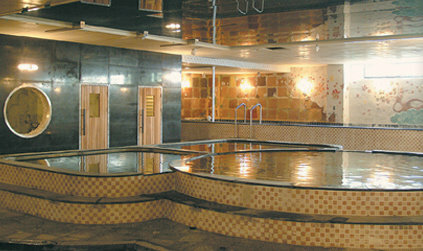 The bathhouse is very spacious and a great place to relax or socialise. Occasionally you see other foreigners but they tend to stick to the gym. I wasn’t that impressed with the jimjibang area except of course the massage machines at 1000 won a pop. 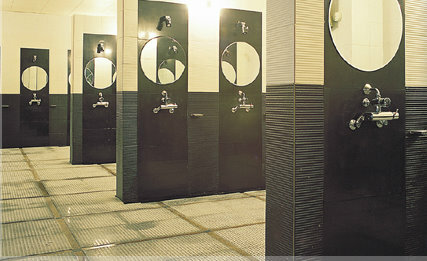 A highly recomended bathhouse to check out. Hey Luke, thanks. Unfortunately the jjimjilbang is now smaller since the pool rooms were added. But then the establishments has some handy new additions in other areas!